This week's Cycling Voice comes from Hannah Bussey, previously a civil servant in the South-east, and now a journalist and mother in the North-west. Hannah talks about dealing with the lifestyle change, and how being in the cycling community really is like being in a supportive family. "I've been cycling since forever, but I have been riding seriously for about 17 years. I got into cycling when I started working in an office in Guildford at the same time as a guy called Tim Morley, the then National Cyclocross Champion. He was very handy on a mountain bike too, so as we got on well, he helped me build a mountain bike from old parts of his bike. Then Tim left the company to join British Cycling, before moving to Australia. We stayed in touch for a bit and he encouraged me to ride more. Eventually, I got into triathlons, racing for Farnham Tri Club, and even qualifying for the World Age Groups Championships along with Emma Pooley [Olympic road time trial silver medallist]! My now partner realised I was better at bike riding than swimming or running, so I decided to stay with just cycling. They were great times and I met lots of cycle racers in the various events I did - criterium races and road races around the country as part of the women's team series and national series, and I raced abroad too. I stopped road racing five or six years ago when I broke my pelvis in a bad crash in China, during the Tour of Chongming Island, and seemed to lose my edge after that. I did try and make a comeback on zero training at the Tour Series, but quickly realised a) you can't blag a criterium race and b) I wasn't hungry enough for a win to go out and train! Then I found cross-country mountain bike racing, which I totally loved. It was local, which is always handy, and every race was like going to a festival. It was so different from road racing. The atmosphere was laid back, there was music on a sound system, a compere, there was a vibrant, trendy feel about the events. My favourite bike ride is going to Majorca in early spring. We usually go there every year, but for the first time in 13 years we won't be going this year. Since having my daughter, Kodi I have tried to race again, but it requires too much time with training and admin so have decided to let it take the back seat while she's still little. Nowadays, I ride mainly for my job as a technical writer for 'Cycling Weekly' magazine. I get to test anything bike-related, and then write about them. This includes different bikes, so at the moment I am testing a Specialized Ruby. I also meet up with cycling clubs for a ride, and check out the routes for cyclosportives. It sounds like I do loads of riding, but I have to squeeze this all into one day a week! The cycle journalism is something I totally fell in to! I was previously working as a policy advisor in a Government department, and this involved writing policy documents and speeches for ministers. I got to know a few of the guys from 'Cycling Weekly' through racing. My mate James Millard, a recently retired professional cyclist who I knew through racing and training camps, invited me to join him on a photo shoot. This coincided with our whole office at the Government department being made redundant, so I said yes to more photo shoots and started doing a bit of writing for the magazine, then eventually I was offered a full-time job at 'Cycling Weekly'. The transition was bloody hard though. It was a totally alien environment that tested me so much, and it still does! Basically, I went from rules, regulations, policy and procedures of government, to journalism - which was the total opposite! I've also got dyslexia, which means it takes me longer than most to write things. I have no idea how sub-editors do their job! They are like gods to me! I must say it was my days of suffering in tough cycle races in the gutter in Belgium that made me persevere with it! In fact, although it doesn't seem like there is any connection between my work in the Civil Service and what I do at the magazine, the common thing is that both roles involve translating complex information into bite-size, easy-to-understand articles for the lay person. In those days I lived in the South of England, near Aldershot. Now I am based in Hazel Grove, near Stockport. The South-East and North-west are mega different! I totally loved riding down South, but coming up here has made me fall in love with road cycling all over again. The hills and vistas are huge up here. It's more like cycling used to be, with proper club runs and mud guards etc. Although I've got the best mountain biking on my doorstep, I do find it restrictive as I just don't know where to ride off-road and don't have anyone to ride with. Where I used to live, in Hampshire, there were trails from my back door for miles. I've lost confidence since having Kodi, and up here it seems to be a case of go big or do nothing! I need to find my off-road mojo again! 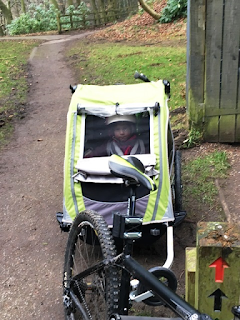 Kodi will be three in May, and has just started riding an Islabikes balance bike. She's going great guns, though we’re just letting her dictate the pace right now. We're really trying hard not to pressure her into bikes, but as cycling is such a big part of our lives, we hope she'll gravitate towards it! I've also just started cycling with Kodi in a trailer. I've always been apprehensive about being on the road with her, so we stay on traffic-free routes. Kodi's a spirited child, so has only just decided that she likes sitting down occasionally. I would never have got her into the trailer as a baby as she hated being put down - until she learned to walk! I didn't cycle much during my first four months of pregnancy as I'm prone to injury and didn't want to get into changing positions. Instead, stuck to running and doing a work-out until Kodi was born. A few months off the bike after over a decade of cycling wasn't a big deal for me. Juggling cycling and motherhood is not easy at the moment. I'm an attachment parent, so don't like to leave Kodi for long. Not having childcare and working two days a week is a constant juggle. Some weeks I do six hours of cycling, but there are other weeks when I don't ride at all. It's a far cry from when I was training 15 hours week. Motherhood has made me become acutely aware of my responsibility now, so I'm not willing to take risks. I get scared on the road occasionally, so stick to quiet lanes. Despite not riding much, cycling is still the backbone of our lives. It's how I met my partner so we’ll always have riding in our lives. I love cycling because of the freedom and head space it brings. It can give you space to think or space to forget. Cycling really is everything to me. I have a handful of friends I met when having Kodi, who don't ride. Also my best friend is a school friend who doesn't ride either. After them, I would consider my cycling friends as family. You go through so much together and even if you no longer race together now, you're still in contact, and grow old together. The cycling scene is so close that you really feel each other's joy and sadness. When Charlie Craig [2016 Under-16 cyclocross national trophy winner and son of Nick Craig, multiple national mountain bike and cyclocross champion] suddenly died recently we were more than heartbroken. It rocked the cycling community to the core. I can't describe the feeling of losing him. The whole Craig family have been a huge role model for us, even before we had Kodi. In fact, seeing their lifestyle of combining family with bikes was the catalyst for us to start our own family. Charlie will never be forgotten, he really is the golden thread that runs through us all. I suffered two miscarriages last year, the second one happening just before Christmas, and I struggled with starting to ride again. The Craig's words of celebrating life have really emotionally moved me to start riding again and be joyful for all the small things. I could go on and don't think I've really done it justice as to what cycling means, but without bike riding we wouldn't have that almost spiritual feeling for being."